This is Pork Bistek Tagalog. 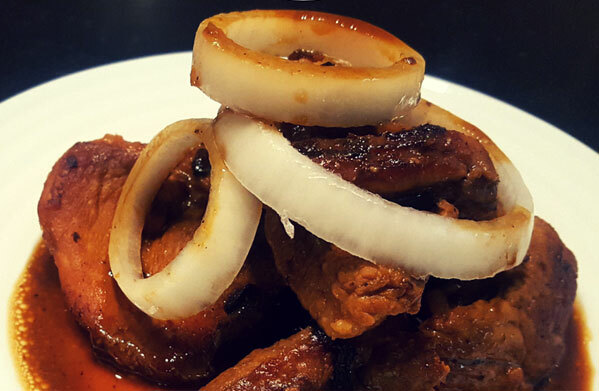 A dish made with onions and strips of sirloin pork slowly cooked in soy sauce, and calamansi juice. Its original version is Bistek Tagalog which uses beef instead of pork. 1. Combine calamansi juice, soy sauce, garlic and brown sugar in a bowl. 2. Add pork sirloin and marinate for about 30 minutes. 3. Heat oil in a pan over medium heat. Add onions and fry until translucent. Add garlic. 4. Cook pork for about three minutes or until brown. 5. Scoop out the juice/sauce, then let it fry. Check occasionally. 6. Add marinade and juice/sauce. Simmer for 8 to 10 minutes or until cooked. 7. Add onions and season to taste. Serve while hot.